VersaCheck™ X1 Payroll gT allows you to create and print custom checks, print directly from any accounting package, manage all your finances, and process incoming and outgoing payments. 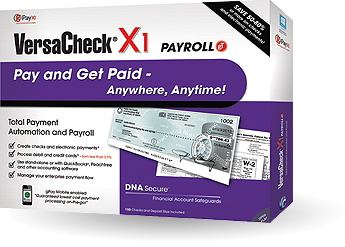  Create & Print DNA Secure Checks! Note: Download orders do not include check paper. tax and voluntary deductions. All Federal, state and local taxes are guaranteed 100% accurate. Email reminders for paydays and tax reminders make sure you know what to do and when. Step-by-step instructions walk you through the payroll process. When federal tax deposits and tax filings are due (941s, 940s, 944s and W-2s), you’ll get an email reminder. Federal forms are sent electronically on your approval. state forms or guiding worksheets and more. Achieve control and savings of printing your paychecks and paystubs yourself. Save 50-80% vs. preprinted bank or mail order checks! Works with QuickBooks®, Quicken®, Microsoft ® Money & more.